Five stories connected by a linking narrative make up the anthology horror film, Dead of Night. Though it wasn’t the first portmanteau film ever made, it has influenced many filmmakers. Martin Scorsese lists Dead of Night as one of the scariest films ever made. It was also one of the few horror films made in Britain during the era. Horror movies were banned in Britain during the war. 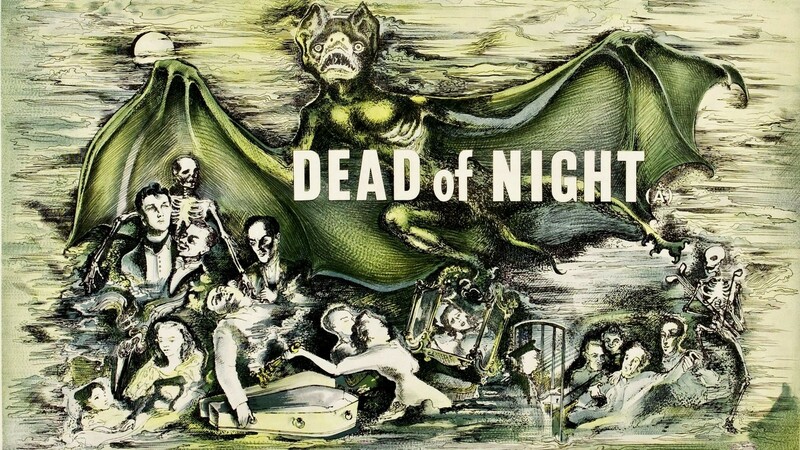 Produced by Michael Balcon for Ealing Studios, Dead of Night boasts an A-list cast of British actors, directors, and writers. Spurred on by the dreams of Walter Craig (Mervyn Johns), an architect who’s come to design an addition, a group of people in an English country house discuss their dreams and what they mean. At first skeptical, the people, with the exception of Dr. van Straaten (Frederick Valk) begin to believe their dreams are telling them something. Basil Dearden (Victim) directed the first story, “Hearse Driver” along with the tale that links all the others. Dearden is one of my favorite British directors. If you haven’t seen Victim, Sapphire or All Night Long, run out and do so right now. Anyway, in “Hearse Driver”, Hugh Grainger (Anthony Baird), a race car driver, wrecks his car in a race and goes to the hospital. As he recovers, he dreams he sees a hearse driver in a horse drawn carriage beckoning him. After his release, he sees the same driver, now a bus conductor, say the same words from his dream, “Just room for one inside, sir.” Grainger doesn’t take the bus. Was that a good decision? That would be telling. “Christmas Party” stars the endlessly appealing Sally Ann Howes as Sally O’Hara. Sally attends a party full of children, but meets a little boy who wasn’t invited, because he’d been dead a hundred years. Alberto Cavalcanti directed the second segment. It’s chilling and also sweet. Googie Withers and Ralph Michael star in the next piece, “Haunted Mirror”, as Joan and Peter Cortland, a newly married couple. Joan tells the group that shortly before their wedding, she bought her intended an ornate mirror at an antiques shop. Soon after hanging the mirror, Peter sees things when he looks into it that aren’t actually there. He seems to be getting a bit cranky, too. Jane does a bit of research and finds that the original owner of the mirror was not a wonderful guy and he, well, sort of killed his wife. Is Peter seeing things through the eyes of a killer? Do you hear or fear or do I smash the mirror? In the comedy, “Golfing Story”, Basil Radford and Naunton Wayne play best friends who love golf. At their favorite golf club, they meet a woman, played by Peggy Bryan. Both men fall for Peggy and decide to play eighteen holes for her. It’s not as nasty as it sounds. The vignette is played as a very British comedy and Peggy has a say. Basil’s character wins and Naunton decides to end it all. Later, he returns as a ghost. Radford and Wayne gained fame as cricket fans in The Lady Vanishes and acted together in several films after that. This segment acts as the comic relief. It’s light and silly. The fifth part of the film, “Ventriloquist’s Dummy”, is the one most people remember. Michael Redgrave plays Maxwell Frere, a ventriloquist with an unruly dummy. The twosome are successful and perform at the swankiest clubs, but something is amiss. Hugo begins to miss cues and refuses to sing songs in the script. Who’s Hugo? Oh, he’s the dummy. Yup. Dead of Night is the original dummy-is-taking-over-and-no-one’s-sure-who’s-in-charge film and it’s a good one. Michael Redgrave looks like he’s really ventriloquizing. Redgrave is good anyway, but in this he’s mesmerizing. He appears for a short time, but makes a big impact. Dead of Night is an entertaining and well made film. This is a film Criterion needs to add to its arsenal. LOVE this film. One of the most overlooked, influential and under-rated anthology films ever. Totally agree that Criterion should give it some attention. Great review, Kerry! Thank you, Vic!! I love it, too!